Gifts can break you at this time of year, even if you don't spend much on any one item. But how to still have presents? 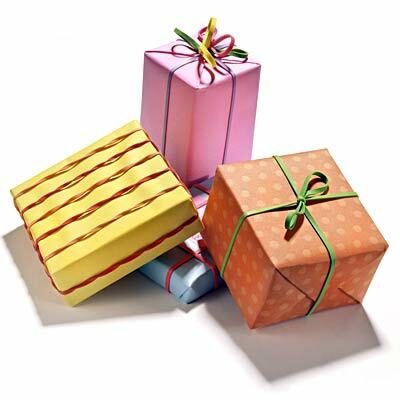 A white elephant party is a fun way to regift items you already have and don't use. Everyone wraps an item from their home, pulls numbers from a hat, and then chooses gifts in numerical order. Everyone can either steal a gift from someone else, or open a new one. The person who had to choose first gets to go again at the end to choose whatever gift they like from the whole game. As host, wrap a couple of extra items in case someone forgets to bring something so that everyone can still play. For gift giving, especially if you have a lot of friends and colleagues you feel compelled to honor, make a donation to a local charity with a list of their names attached, and send everyone cards that says that this year you gave money in their honor. No one can be disappointed to know that you are helping others at this festive time. My personal recommendation is to be sure to not accidentally choose a divisive charity, so stay away from anything with religious or political overtones. I always like any organization that feeds the hungry, provides clothes or shelter to those without, honors the families of fallen police officers or firefighters, or supports children. I tend to think local instead of global on this one, something that your friends will recognize as being present in your community, like a local shelter or soup kitchen. Cards and postage can get expensive, so go e-card this year...there are plenty of places to do it for free, and it is very eco-savvy. If you have kids, have a card making day for the special people who should get something for the mantel...plenty of crayons and glitter will make it fun for them and much more meaningful than regular store-bought cards. Mix CDs are easy to create with current iTunes and other software, and you can print custom labels pretty quickly. Blank CDs a pretty inexpensive, as are simple sleeves to put them in. Make a CD of fun tunes, label it with a clever picture or title, and give the gift of personalized music to your pals. Love this post, Stacy - great ideas, because I'm starting to see Christmas as more wasteful than any other time of year. It's expensive, over in a flash, and then everyone gets SAD. Another thing I like to do is just bake. It's relaxing, puts me in the spirit (usually there's music and booze involved in the process), personal - especially when you remember what your friends loved the most from your baking exploits. Thank you for the non-commercial approach to the part of the year I'd rather just spend far away from all of it!